When there is a will there is a way. Scientists from CEA's WEST (Tungsten Environment in Steady-State Tokamak) fusion experiment, Cadarache, France, "hosted" virtually in their control room several of the colleagues siting in the Remote Experimentation Centre (REC), Rokkasho, Japan. The 8 h time difference and the 9620 km of distance were not an obstacle. In fact, we will see more of these encounters in future given the fact that scientists working in REC will be allowed to follow remotely ITER experiments. This first virtual encounter, qualified as a test, marked the beginning of this trend. Collaboration and technology hold the key to making this possible. Both concepts are at the centre of the Broader Approach Agreement, signed between Europe and Japan, on a number of fusion projects which aim to push forward our know-how. The test was financed by F4E, responsible for the co-ordination of the European contribution to the Broader Approach projects, one of them being the International Fusion Energy Research Centre (IFERC) which supported this initiative. Experts in the REC control room (Rokkasho, Japan) following the WEST-REC tests, financed by F4E, as part of the Broader Approach Agreement signed between Europe and Japan. A total of 70 scientists from both institutes, representatives from F4E, EUROfusion, local policy-makers, journalists and students took positions in the two control rooms to witness the experiment unfolding in the south of France. The moment the countdown started all eyes were glued on the screen, a few seconds later the plasma and its parameters were projected. Both control rooms burst in rounds of applause. The virtual encounter lasted approximately three hours and was the first of such kind. "Witnessing the three plasma shots in real time strengthened the bonds between the two communities as if we were all physically present at WEST experiencing the experiment," explains Susana Clement Lorenzo, following on behalf of F4E all IFERC activities. "Such initiatives help scientists to exchange know-how by sharing data, and train them to perform more of these tests in future. Next year, for instance, we plan to carry out a similar exercise with JET," she explains. 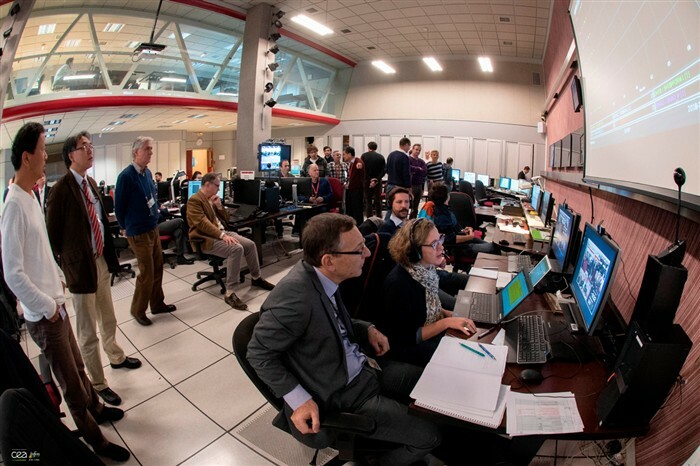 Viewing a series of plasma shots from the control room of the biggest Tokamak currently operating is expected to generate a lot of enthusiasm to the members of the fusion community.